Shades of Mort'ton is a profitable minigame that also allows the player to create Splitbark Armour and Necromancer's Gear. Splitbark Armour is tier-40 magic equipment and Necromancer's Gear is a highly sought-after cosmetic override to Dagon'hai robes. The yellow line is the way through the swamp, but this is the slowest way. The next fastest way is by using the Hollows path, which requires completion of In Search of the Myreque Quest. Faster yet is by way of Burgh De Rott (requires partial completion of In Aid of the Myreque), which is the closest bank to Mort'ton. You can use Drakan's Medallion (from the Branches of Darkmeyer) to get to Burgh De Rott quickly. You will have to repair the temple, so you will need cash to buy the needed items; about 15,000 to 20,000 coins should be a good amount. If you are planning on burning the shades, bring logs and a tinderbox. If you can, use a Salve Amulet to increase your effectiveness against shades (obtained from the Haunted Mine Quest). You will need supplies to rebuild the temple and increase sanctity. Your supplier will be Razmire, the general store owner who will only talk to you if he is not afflicted. If you have not done so already, you should use Serum 208 on him to permanently cure him of the affliction. This is obtained by using Serum 207 on the holy fire altar. If you do not do this, you will have to use Serum 207 on him every time you buy supplies. Flamtaer Hammer - 13,000gp from the General Store. A regular Hammer works too, but the Flamtaer Hammer is much better for this minigame. Swamp Paste - 31gp each from the Building Store. Limestone Bricks - 21gp each from the Building Store. Timber Beams - 1 coin each from the Building Store. Olive Oil - Three doses can be purchased from the General Store for 26 coins each. You can make your own Swamp Paste by getting Swamp Tar from Mort Myre, using it with flour and cooking it on a Range. You can mine Limestone from the quarry west of the Priest in Peril church and use it with a chisel to make it into a brick. For every timber beam, limestone brick and five swamp pastes you put into the temple while rebuilding it, you will gain five resources on the Temple Repair popup. To get to the temple, head northeast from Razmire's shop and you will find a bridge. Cross the bridge and you will be on an island. There will be a large gray circle where the temple needs repairing. You should choose the Shades of Mort'ton world to do this if you do not have a group of friends to help you. You can gain sanctity either by attacking the shades or by repairing the temple. You will gain two sanctity per Loar Shade killed in the vicinity of the temple and four to five sanctity per resource consumed while repairing the temple. To sanctify olive oil or Serum 207, light the holy fire altar in the center of the temple (this can be failed). Once it is lit, use the olive oil or Serum 207 on the fire altar. You will lose a little less than 1% sanctity per each dose of olive oil sanctified and about 3% sanctity per each dose of Serum 207 sanctified. You need a minimum of 10% sanctity to sanctify olive oil and 20% sanctity to sanctify Serum 207. Regardless of how many shades are attempting to take down the temple, one person repairing the temple will be able to keep the repair state at 100. Once your backpack's full of Holy Oil, go back to the Canifis bank and use them on the logs you will need for burning the Shades. The type of log you need depends on the kind of Shade you'll want to kill and burn. Now that you have finished with the temple, you can deposit your Flamtaer Hammer in a bank and withdraw your pyre logs and shade remains. If you cannot bank easily, you might want to consider withdrawing your pyre logs in note form and unnote them at the general store. There are five different kinds of Shades you can kill and burn: Loar , Phrin , Riyl , Asyn , and Fiyr . The prayer experience gained involves both the type of shade and type of log burned. Go to any of the Pyring Stations around the village and use the logs with it. Then use the Shade Remains with it and light the logs with your Tinderbox. 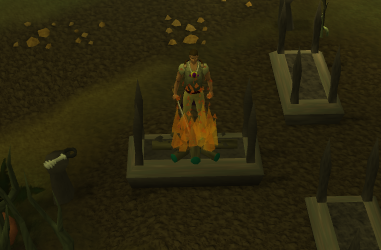 A stone stand next to the funeral pyre will have your reward on it, which is either a key or coins. The type of key you obtain is based on the type of shade you burn. The better the shade, the better the key, and the better the rewards. Loar Shades - sometimes drop Bronze Keys when burned. Phrin Shades - sometimes drop Steel Keys when burned. Riyl and Asyn Shades - sometimes drop Black Keys when burned. 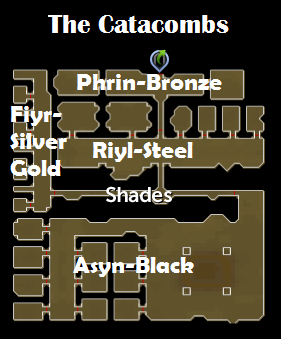 Asyn and Fiyr Shades - sometimes drop Silver Keys (Only dark red and brown looped ones from Asyn Shades) when burned. Fiyr Shades - rarely drop Gold Keys when burned . There are keys with individually colored loops (dark red,light red, light brown, dark brown and purple). The stronger the Shade who's remains you burn, the higher the chance of receiving a rare key. The rarer the key, the higher the chance of receiving Fine Cloth for Splitbark Armor! Walk to the northwest of Mort'ton and behind some ruins you will see some wooden doors. If you have a key in your backpack, you can enter the catacombs and loot chests corresponding to the keys you have. This is also the location of higher leveled shades. You can obtain a wide variety of loot in the catacombs. The loot often comes with coins. All keys of a certain type have the same drop tables, however black and purple keys tend to give better items than brown, crimson, and red keys. 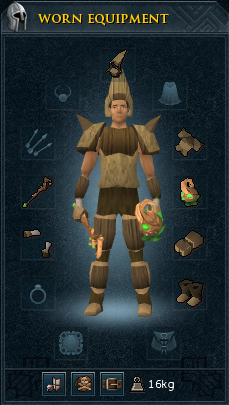 Items you can get from bronze keys (off-hand equivalents not shown). Items you can get from steel keys (off-hand equivalents not shown). Items you may receive from Black keys (the ones from cremating shades, not the ones on the piano). Items you may receive from Silver Keys. Put your fine cloth to good use! To make Splitbark Equipment, bring fine cloth, bark from a hollow tree, and coins to Wizard Jalarast on the second floor of the Wizard's Tower. She is in the southwest room. 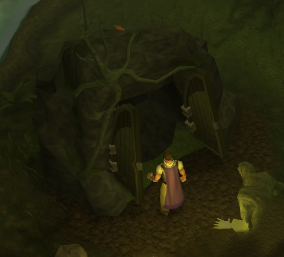 Bark from a hollow tree is obtainable by cutting a hollow tree in the Haunted Woods (there is one located directly east of the Canifis Bank). You will need 45 woodcutting to cut this tree. To obtain the full armour set, you need eleven pieces of bark and eleven pieces of fine cloth. To obtain the splitbark orb/shield and spitbark wand, you need five pieces of bark. 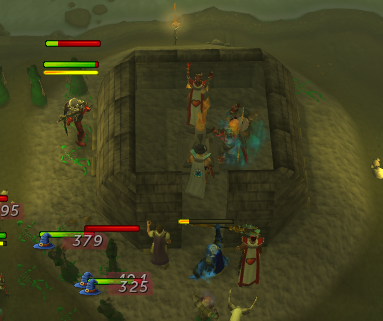 Splitbark armour has a level forty defence requirement and is the best magic armour at this level. While looting a Gold Chest, you may find a Shade Skull or a Necromancer Kit. Shade Skulls can be used to adorn any elemental staff or battlestaff to create a skeletal staff or a skeletal battlestaff, respectively. This is purely cosmetic and can be removed at any time. You may also use a Necromancer's kit and ten pieces of fine cloth on Dagon'hai robes to create Necromancer's Robes . One kit is required for each piece, so three kits are required for the whole set. You can remove the kit at any time, but you will not recover the fine cloth. You do not need to complete the Hunt For Surok miniquest to wear these robes. 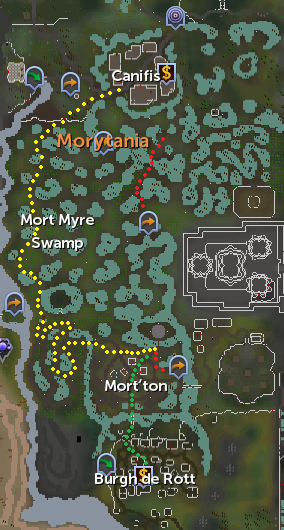 If you are wearing Morytania Legs 3 or 4, you will have a greater chance of receiving a gold key. You may want to decant olive oil at the general store, especially if you have long bank trips. The temple falls apart every several hours regardless of how many people are working on it. Sacred oil, pyre logs, and Fiyr shade remains sell for large amounts of money on the Grand Exchange.